I am a person who easily gets bored of doing the same thing over and over or eating the same thing repeatedly. That is probably why blogging is a good discipline for me because it allows me to chronicle my discoveries. (I am also quite critical so even though I try new things the pictures or flavors don’t always meet my expectations and then I don’t like to blog about them. Therefore, my blog is only a representation of things I like. Maybe not a bad thing, but this blog doesn’t usually explore the attempts that fail.) Anyway, I digress. I am in charge of baby and wedding showers at our church and we have had several baby showers lately. Repeatedly organizing showers leads me to boredom when we do the same thing over and over again. Even when the traditional cake is replaced with cupcakes, I still grow tired of the same old same old. When the time arrived for me to organize another shower, I decided to dump the cake all together. On Pinterest I saw that someone had a milk and cookie party and thought it would make a great shower idea. So I fired up the oven and got to baking. 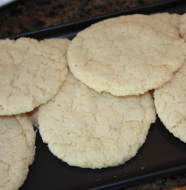 (Maybe this approach was not as easy as baking a cake but we did have a variety of cookies to eat.) The change of pace was also very well received by those in attendance. Unfortunately, I did not take any pictures of the shower but I did want to share with you one of the cookies that I baked for the occasion. 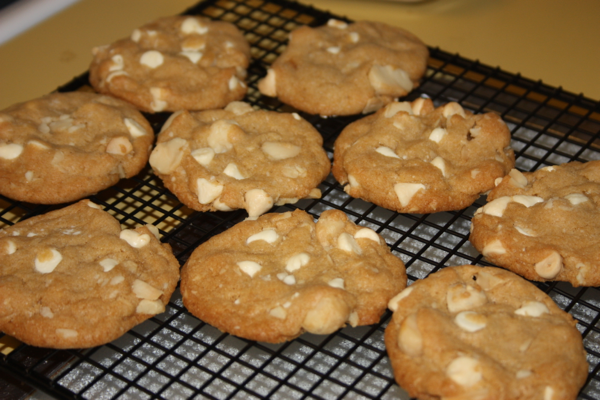 I have always been a fan of white chocolate macadamia nut cookies, but don’t often bake them. (They are a frequent purchased dough from school cookie sales though.) Since both Jeffrey and I are fond of them, I thought it was time to try my hand at baking them from scratch. 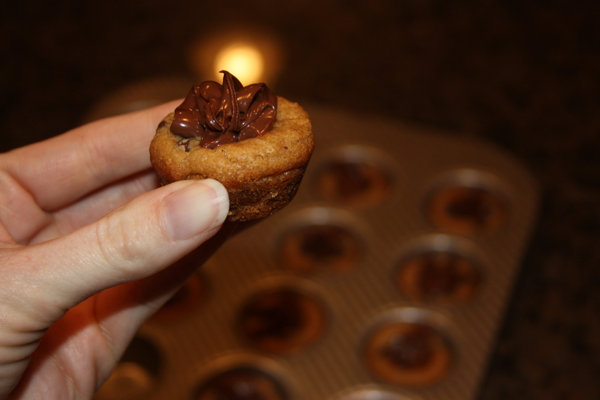 They turned out quite delicious and topped Jeffrey’s favorites list. Preheat the oven to 325 degrees F. Grease baking sheets or line with parchment paper or a silicone baking mat. In a medium bowl, whisk together the flour, baking soda and salt and set aside. Gradually add the flour mixture to the sugar mixture mixing on low until just moistened. Stir in the macadamia nuts and white chocolate chips by hand with a rubber spatula. Roll into balls or drop by heaping tablespoons onto baking sheets, and press down on the cookies with your palm a bit to slightly flatten. Bake for 11-15 minutes or until the edges look golden brown and the middles don’t look quite set. Allow to finish cooling on the baking sheet. One Comment on "White Chocolate Macadamia Nut Cookies"